Several houses in South Africa were reportedly damaged, while cars were burnt on Monday following the arrest of nine taxi drivers after a Zimbabwean man was attacked and killed in his tuckshop in Klerksdorp. According to reports in the neighbouring country, the situation had been tense in the North West province since Sunday morning‚ when patrolling police found a man with stab wounds. He said a group of taxi drivers gathered with the intention of avenging the death of their colleague‚ claiming he had been killed by foreigners. “According to information available at this stage‚ reports suggest that later during the day‚ a 28-year-old Zimbabwean national was allegedly stabbed with a knife in his chest by taxi drivers while at his tuckshop‚” said Brig Mokgwabone. 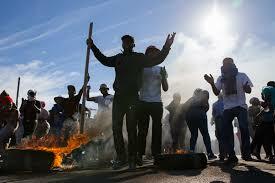 Brig Mokgwabone said the public order policing unit managed to normalise the situation. Police then arrested nine suspects‚ aged between 22 and 52‚ on Sunday afternoon in connection with the murder of the foreign man and for public violence. At around midday on Monday‚ Brig Mokgwabone said community members had started damaging property at Pienaarsdorp‚ where numerous foreign nationals live.